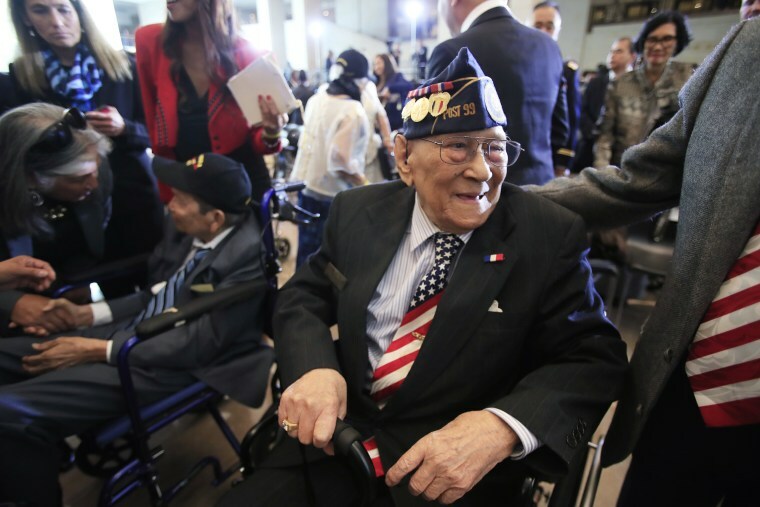 More than 260,000 Filipinos fought in World War II on behalf of the United States, many paying the ultimate sacrifice. Though reliable data isn’t available, he said he believes most are living in the Philippines. Many came to the U.S. in 1990 after receiving citizenship for their service, de Guzman said. Some stayed, while others returned to or never left the Philippines, he said. The original will go to the Smithsonian, according to de Guzman. Among them are the Japanese-American Nisei soldiers of World War II; the Montford Point Marines, who were the first African-American U.S. Marines since colonial times; and the 65th Infantry Regiment Borinqueneers of Puerto Rico, which fought in World War I, World War II, and the Korean War. At Wednesday’s ceremony, Emancipation Hall fell silent as Almeda prepared to speak. Rising from his wheelchair, he made his way to the stage, resting his cane against a table next to the podium. He reached into his breast coat pocket and pulled out a piece of paper with his remarks.